No matter how much room there was when you bought your phone, chances are there's not much left - here's how to fix it. It seems the majority of phone users are either always running out of battery or always running out of storage space - or perhaps both. We're here to help you fix the second of those perennial problems, with some tips on freeing up some extra room on your device. There are several ways you can claw back a few gigabytes, or even add more space than you had originally, which we'll cover below - hopefully you'll never have to put up with a "no room" message alert when you're about to snap something memorable ever again. Those apps you rely on can take up a significant chunk of room on your phone - so ask yourself if you really, really need to have them installed (you can always download them again in the future). Games are particularly notorious for taking up large chunks of space on your phone - all those graphics and videos have to go somewhere - so it might be time to cut down on the number of gaming distractions you've got at your fingertips. Android and iOS actually let you see which apps are using up most space on your devices. On Android, head to Settings then tap Storage and Apps - the size of each one is listed underneath. On an iOS device, go to Settings then select General, Storage & iCloud Usage, and Manage Storage. The biggest apps are shown at the top. Tap on an app on iOS or Android for more details - in some cases you can clear out a cache of temporary files to free up a bit of extra room without removing the whole app. Probably the biggest storage hoggers on your phone are the photos and videos you've taken on the device, but both Apple and Google having been adding options to make it easier to back these files up elsewhere. Apple has the iCloud Photo Library, which gives you 5GB for free and more for a fee. Images and video will be synced across all your Apple-made devices and the web, and if you go to the Photos & Camera menu in the iOS Settings you'll see an option to Optimise iPhone Storage: this keeps low-res versions of your pictures on the device, with the high-res originals safely stored in the cloud. Google Photos, which is available for both Android and iOS, does something similar. In this case you can store as many photos and videos as you like, as long as you don't mind them being resized down to 16 megapixels and 1080p respectively (if you want to store files are their original resolutions, you can pay to increase the 15GB of room you get for free). As with iCloud, the app also offers the option to wipe local copies of your files once they've been backed up on the web. That's your photos and videos taken care of but don't forget your music - if you've got your tracks saved somewhere else then you can remove them from your phone. As for streaming services, see how many playlists you've synced for offline playback, and get rid of the ones you're not listening to (in Spotify, for example, synced playlists have a green download arrow next to them). If you've bought yourself an Android phone then it may well give you the option to expand the internal storage with a microSD card - check your phone's specs for details. If it already has a card installed, splash out on a bigger one. The Galaxy S7 is one phone with such a memory card slot, for example - you can pick up cards up to 200GB in size, which will set you back in the region of £80 or so. If you're happy to opt for something with less capacity then the price drops pretty sharply. 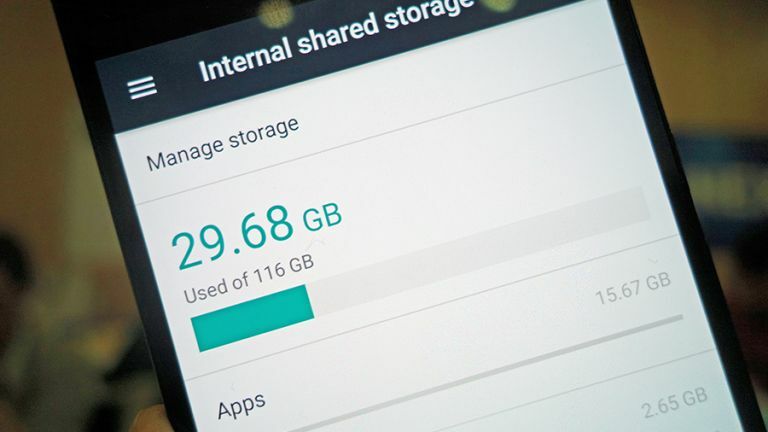 Exactly how this extra storage is handled is going to depend on the make and model of phone you're using and the version of Android you're running, but you might be able to move apps over to the card as well as photos, videos and other types of files - go to Settings and Apps then tap on an individual app to see if it can be moved. If you're on an iPhone there's nowhere to put a memory card, but you can get storage-boosting cases and dongles like the Sandisk iXpand flash drive - the accompanying apps will let you move files to and from the extra storage, with isn't something you can do easily with iOS alone. This is the nuclear option when it comes to freeing up space on your handset - it basically puts everything back to the way it was when you first got your phone, so there's no physical way of freeing up any more room than this. That means some preparation is required - you need to make sure everything on your phone, from gaming high scores to precious family photos - is safely backed up somewhere else before you get started. We've already mentioned a couple of options for photos and videos, but there are plenty of other options out there. On iOS, you need to open up Settings then tap General, Reset and Erase All Content and Settings (you'll need to enter your PIN to confirm the action). On Android, the option is under Backup & reset - hit the Factory data reset option and you're away.